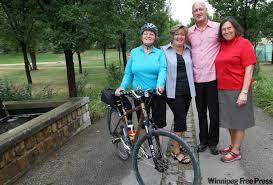 The City is taking a first step in a long-term commitment to support and encourage walking and cycling in Winnipeg. The public service is seeking Council approval for the Pedestrian and Cycling Strategies, a policy document which will serve as a roadmap for civic investments into infrastructure and active transportation support programs in order to make walking and cycling safer, more convenient, accessible, and attractive to citizens. Encouraging walking and cycling creates countless community benefits. Providing greater access and options for walking and cycling will lead to improved health, increased personal mobility, more liveable and socially active communities, and reduced impacts on the environment and our climate. A key component in the development of the Pedestrian and Cycling Strategies planning has been public engagement. The City heard directly from thousands of Winnipeggers throughout the process through online and telephone surveys, public open houses, stakeholder meetings and a workshop, and through the project website. This feedback was instrumental in developing the recommendations and plans in the Pedestrian and Cycling Strategies. Improving connectivity, including expanding the bicycle network, expanding and enhancing the sidewalk network, and addressing barriers to connectivity. Improving convenience to using active transportation by providing bicycle parking and end-of-trip facilities and increasing and improving multi-modal connections. Improving safety and accessibility by providing accessible infrastructure, including improving pedestrian and cycling crossings, developing safe routes to school, and providing well-lit, visible facilities for pedestrians and cyclists to use. Improving maintenance for the bicycle and sidewalk networks. Improving vibrancy of our public spaces by enhancing streetscapes, land development and site design. Increasing awareness by offering enhanced way-finding, signage and trip planning and improving education and awareness on the benefits of active transportation. The full cost to implement the strategies is estimated to be approximately $330 million over the next 20 years. However, consideration will be given to these strategies in the yearly budgeting process and the use of funds for specific projects and programs will be approved by Council on a yearly basis through the Pedestrian and Cycling Action Plan. These strategies will also be implemented in existing road renewal programs, development projects and major capital projects. The Strategies will be a living document and will require continuous monitoring of the implementation actions and continued collaboration with stakeholders. A report outlining the strategies will be first considered by the Standing Policy Committee on Infrastructure Renewal and Public Works on May 5, 2015.